OMTBV7-WTC3 series thermocouple terminal blocks are offered in Type K, J, T and E. The terminal block contacts are made with thermocouple-grade calibration alloys. The terminal blocks come in a Gray color but white blank marker tags are available for identification. OMTBV7-WTS3 series sensor terminal blocks provide connections for 3-wire photoelectric and proximity sensors. The blocks provide a feed-through path for the sensor's output signal only, while the sensor power and ground leads are terminated at the field side only. The power and ground connections can be bridged, reducing your wiring for sensor power. OMTBV7-WTF3 series 3-level terminal blocks provide three feed-through signal paths. 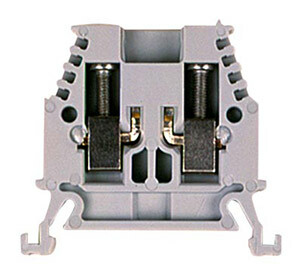 These terminal blocks are suitable for 3-wire RTD connections. Omega’s new OMTBV7-W terminals are designed to meet the three most important criteria when selecting a terminal block line – ease of wiring, secure connections and durability. The line is also comprehensive, offering a wide array of terminal types for most circuits and functions, from control to low level power. Pre-printed marker tabs, single digit (0...9), one card of 100 tabs. Blank marker tabs, single digit, one card of 100 tabs.